Nothing will dangle. Nothing at all. I'm beginning to suspect it's possible to have an entire blog based around things that dangle; modifiers, participles, whatever. They're just so damn prevalent. And it's especially annoying when you understand the intended message and realize the end result is really just laziness. 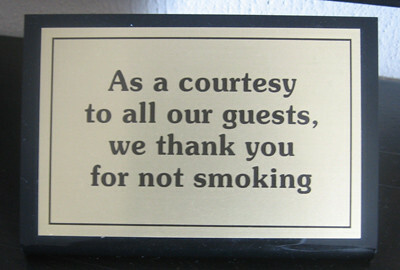 Is the hotel being courteous by thanking us for not smoking? Obviously not; but that's the literal meaning. And in Penn Hills, Pa., Nancy Monahan, 54, who creates floor displays for a discount chain, says her "real job" begins in the evening when she returns to her creaky yellow house and her black cat, Maxine, turns on her computer and starts sleuthing. That, my friends, is one smart cat. Copyeditor General's ruling: Don't let it dangle. That's how accidents happen. Many moons ago, when I was copyeditor of my college newspaper, I noticed an enthusiastic insistence on using the word "perspective" in place of "prospective." A recent online exploration revealed that nothing has changed. I know what you're thinking: Hey, they're just kids. They're still learning. Isn't that what college is for? So someone can teach them the right way to do it? That would be a fine argument, except it appears the grown-ups know no better. If you enjoy suffering, I encourage you too take a look at this rogue's gallery of similar grammatical affronts. I'd planned to post the whole thing here, but decided the image would take too long to load. Seriously. We'll meet back here to console each other afterward. One interesting anomaly is that, quite often, the offending phrase is only in the page title and/or filename. 2) Savvy college marketers deliberately plant the misspelling so the pages show up in search results. Why? Because they recognize that no one knows the difference between "perspective" and "prospective" and may try searching on either one. I'm not sure which option frightens me more. Copyeditor General's ruling: The only time I expect to see perspective students is when they're learning about horizon lines and vanishing points. The AP is at it again. 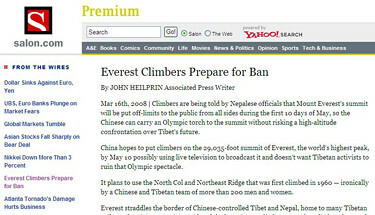 In this morning's news was a story about a Chinese government request to make Everest off limits so the Olympic torch can reach the summit unmolested. Did someone have more to say about China? Or was the writer having a senior moment, the journalistic equivalent of walking into a room and forgetting what you were looking for? Copyeditor General's ruling: If there's an editorial counterpart to tying string around one's finger or making a knot in one's handkerchief, I suggest the AP look into it. Yep, I have no idea what it means, either. 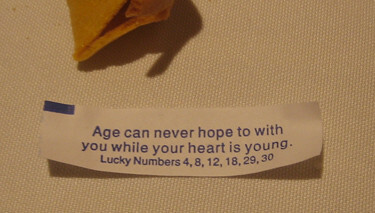 Copyeditor General's ruling: If wonton surrogates have to go, they should be replaced by scallion pancake surrogates. Or perhaps bloggers with a better grasp of linguistic subtleties. **Update: Someone's paying attention over at Slate--the error is fixed, and respect duly given. Thanks for the love, kids! Occasionally in my perusal of online content, I encounter a new error, a mistake I haven't seen before. And deep down in my grammatical gut, I know Something Bad is happening. 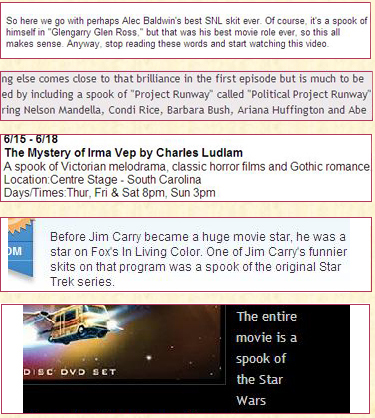 Such was the case this week, when I read a user-generated movie review that referred to a parodic film as "a spook of" another film. A simple slip of the fingers? Not necessarily; hurried typing might produce "spoor" or "spood" or "spoog," but the "k" is on the other side of the keyboard. What to make of this ghastly phenomenon? Is the word spoof falling out of use, rendering it essentially invisible? Are people reading less, so their exposure to the correct word is minimized? Or am I so out of touch with popular culture that I haven't noticed that The Kids are now using this phrase quite legitimately to refer to lampoons, parodies and pastiches? Whichever it is, it scares me. Copyeditor General's ruling: Stop scaring me.